This reclining sectional has it all; a casual style, padded comfort, reclining seats and built-in cup-holders. Designed with a focus on style and value, this reclining leather sectional will offer you the look and feel of leather at a fraction of the price. This piece features two reclining seats, two stationary seats and a chaise, all draped in a bonded leather match. A console with built-in cup-holders is especially ideal for social events or family movie nights. With enough room to seat five guests, this family room sectional sofa is complete with kidney support, defined headrests and baseball stitching for a tailored accent. The Mackenzie Chestnut 6-Piece Reclining Sectional Sofa with Casual Style by Coaster at Value City Furniture in the New Jersey, NJ, Staten Island, Hoboken area. Product availability may vary. Contact us for the most current availability on this product. The Mackenzie reclining furniture collection is the perfect group to add to your home. 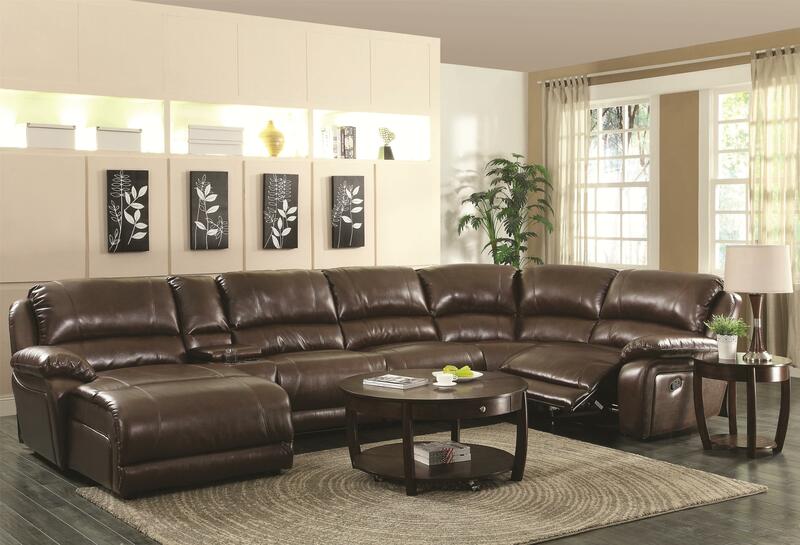 An affordable reclining group, this furniture set features a bonded leather match, giving you the look and feel of actual leather without having to pay the high price point. Sinuous spring bases and sink-into padding work together to give the items in this collection an element of comfort. 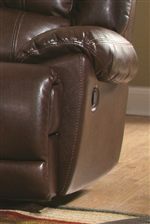 Pocket coil spring seating and kidney back support enhance the relaxation that each piece can provide. The details used to accent this collection include defined headrests, built-in cup-holders and baseball stitching. The Mackenzie Chestnut collection is a great option if you are looking for Casual furniture in the New Jersey, NJ, Staten Island, Hoboken area.